For comfort and a chic design, the Palmer bedding collection is the perfect fit. Its plum comforter is made from pieced microsuede for a soft feel while the piecing details add texture and color with their grey and brown colorways. The decorative pillows add a mix of nature-inspired leaves and simple designs to combine perfectly with this collection for a simple yet dramatic look. Dimensions 90.0 In. X 82.0 In. X 1.5 In. The fabric is velvety and the pillows are Beautiful! Did it give 5 stars because after washing one of the seems on one sham came undone. Otherwise good quality and very nice. I absolutely love the colors in this comforter and they are true to the picture. I thought that the steel grey/blue bedskirt was an odd contrast, but it looks nice. This is super comfy and soft. I love the colors. My only problem is that my mattress is so big that a standard comforter is never wide enough to hang below the side of mattress. This is a lovely comforter set and appears to be very well-made. This comforter set is beautiful, it is also a very good quality. The problem I have is that it is not as wide as the comforter appears in the photo. I do not think they took into consideration that mattresses are much thicker than they use to be. The plum is gorgeous and makes a visual statement. The pillows are beautifully coordinated. Could not be happier. Very happy with comforter set! Rich colors and good quality, thrilled with the price! This is a beautiful comforter set. It's elegant but not overly fancy. It's also quite neutral, so this could be used in a male or female room. I'm in love with it. looks really classy, even though it's fiberboard :) It took us (2 people) 3 hours to assemble, and the instructions are not THAT detailed, but basic handiness made it not difficult. Very fluffy and soft. Feels great against my skin. Looks great. I love my new bedding so much! I didn't realize it was going to be as soft as it is...a pleasant surprise! I've bought this set twice - absolutely loved it the first time but this most recent one wasn't as good of quality as the last one was. I was overjoyed over the vibrant colors and the decorative pillows, however disappointed that the comforter was flat rather than fluffy as depicted in pictured. 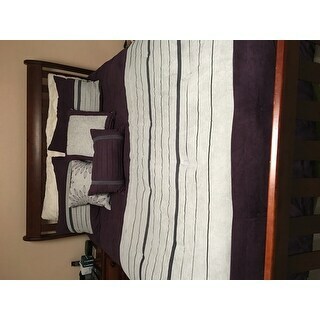 Finally a comforter set my husband d I both love. This is the softest coziest comforter I have ever owned. It comforts me lol. The colors are ideal... not too masculine or too feminine. Would definitely purchase again. Love the comforter and yes I would. This is a very nice comforter set, but the quality isn't as high as I would have expected. I had my previous set for nearly 10 years before it tore at the seams, and this one has tears after a year. "What is the lighter color on the plum comforter? It appears ivory. If I bought ivory sheets will that match? Also my bed is like a white wash which is ivory. Thank u I’m advance"
"Are there matching window treatments. Prefer grommet tops." Are there any valances that match your comforter sets? I purchased comforter set number: 18413549. Sorry, no matching window for this pattern yet. "This comforter description states it is machine washable. What are the care instructions for the dryer?" I have not put mine in the dryer yet, but tag says: tumble dry low. If there is no free movement in washer or dryer, use large capacity commercial machine. Remove promptly. Do not iron. Unfortunately, we do not currently have any matching towels. "What sheet color should I buy with this set? Ivory or grey?" "Is the color of this comforter true to the picture? To me it looks like purple and beige/taupe with thin grey stripes. Is this correct?" Yes, the colors are dark purple/plumish, with taupe and dark grey stripe. very pretty in person. Well, just received my comforter set, and it is NOT beige/taupe and purple! It is GREY and purple! So not what I was wanting! So disappointed!! So NO THANK YOU to the answer I received when I asked about the color! Will not be trusting anyone's answers or reviews! And will not be trusting the color in the pictures! It is not beige/taupe - It is light grey. I just received mine today because I trusted this persons answer and now I am in the process of returning it. It is in no way tan-taupe-beige. The bedding is very pretty!! It is plum, light grey and dark grey stripes. "What color is the reverse side and is the material on the reverse side the microsuede?" The reverse side is all purple, same color as the purple on the front. it is not microsuede.